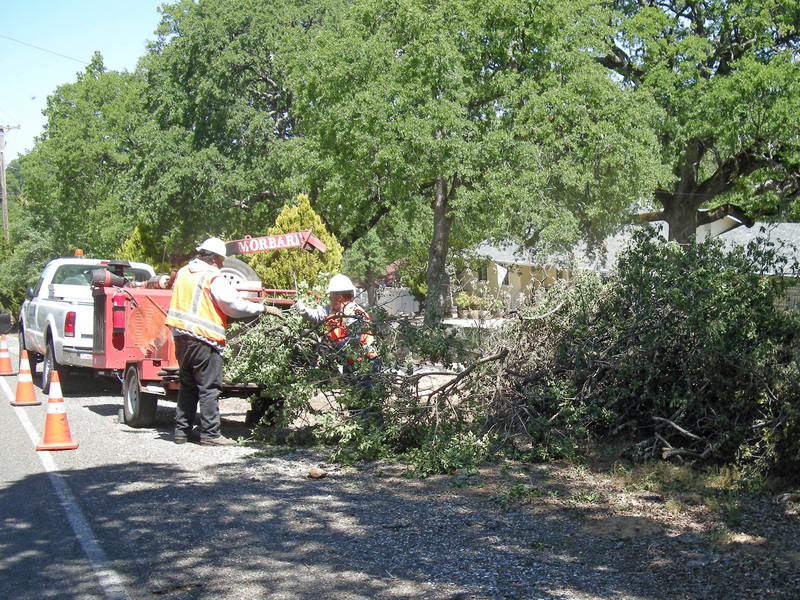 The EDCFSC has received grant funds to provide chipping services for neighborhoods and individual homeowners on the West Slope of El Dorado County who are willing to work to make their property fire safe. Please read the instructions below before submitting your “Request for Chipping”. This program is only available on the western slope of El Dorado County. The Tahoe Basin has other programs and is excluded. This program is not available to properties on Federal land (leased). Program is limited to one visit per calendar year per address. Program is limited to 6 hours of chipping per address on one visit. Please complete all of your work before submitting a request. Valuable chipping time and grant money is wasted responding to requests when the material is not ready. If your work is not complete when the chipper arrives it may be some time before it can return. 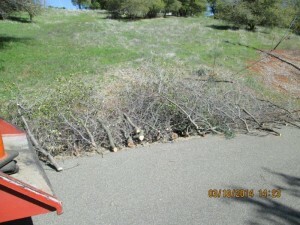 Create defensible space by clearing brush 30′-100′ from buildings and 20′ from roads. Please refer to the CAL FIRE pamphlet (click here to download a copy) for further guidance on creating defensible space. We encourage participants in the program to have a residence on the property. Place brush piles so the chipping machine and crew can have access. The piles need to be adjacent to a driveway, road or street. Piles placed in fields will not be chipped. Preferably pile brush on the uphill side. Do not place piles along busy, heavily traveled roadway, where signage or additional crew would be required by County or State Code for safety. This is not covered under the Fire Safe Council’s contract. Also, when placing the brush piles place it in an area that will be out of your way and in a location where there is access for the equipment to turn around. Refer to the picture for an example of the equipment. 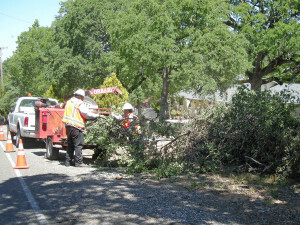 Recently removed vegetation will chip better than old dried out branches and shrubs. It is easier and more efficient to chip the piles if they are wider and spread out rather than taller. All the cut ends need to be facing the same direction. Please follow the illustration below for additional instruction on preparing your piles. The chipper can handle material up to 7″ in diameter (no root balls). The equipment does not chip individual branches that are small (rakings) or old-decayed wood well. Your piles should look like the one in the picture below. Improperly stacked or located piles may not be chipped (contractors option). Keep all piles free of rocks, dirt, wire, lumber, spiny plants, poison oak, and blackberries. The chipper can not chip piles of pine needles or leaves. You can dispose of this material in green waste carts available from El Dorado Disposals or in Community Cleanup Green Waste Dumpsters when they are available. The time you spend cutting and stacking material for chipping is used for an “in-kind match”. Meeting match requirements for this grant will help us to obtain future funding to continue this program. Please be as accurate as possible in reporting your time. The Fire Safe Council contractors do not operate equipment on RED FLAG warning days as determined by the National Weather Service. If you are scheduled for chipping on a day that is a Red Flag warning day you will be rescheduled. Chipping time will be limited to 6 hours per parcel to be done in one day. Pre-inspections are available upon request. You do not have to be home the day you are scheduled for chipping. Please remember that this service is at no cost to the resident, it is taxpayer funded by a grant from the USFS administered by the El Dorado County Fire Safe Council. “Request for Chipping” form, accessible by clicking here. If you have problems with the”Request for Chipping” form please report them by clicking here.